We all have memories of past and present lovers – what they looked like, how they spoke and more importantly, how they smelled. Smell is the closest link to our memory and with one small whiff of a fragrant trail, one can be transported back to a time and place, or even back to a person. This is why the perfume industry goes a bit mad for selling fragrance as a tool to attract potential partners. It’s all about getting close enough to smell and fall in love with someone. We’ve not really evolved from apes sniffing each other really, have we? Perfume and romance have always walked hand-in-hand, and some of the greatest perfumes have been created as gifts of love. Aimé Guerlain famously named his masterpiece, Jicky, after an English student he fell in love with. Sadly for Aimé, the love was unrequited but luckily for us perfume lovers, the world was given Jicky the fragrance. One of the latest scented tales of romance comes from French fashion house, Chloé who have just launched Love Story created by perfumer Anne Flipo. 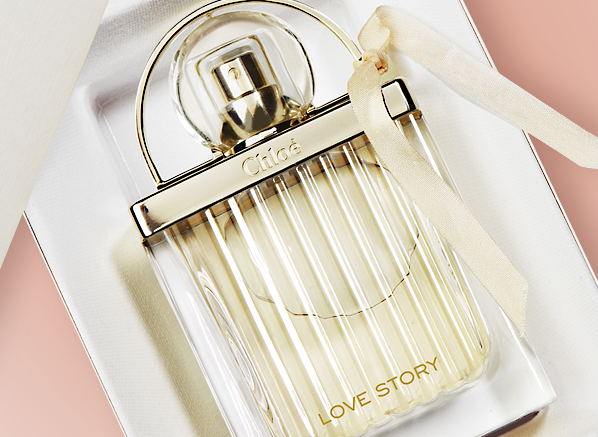 Housed within a padlock shaped bottle (to evoke the locks lovers attach to the bridges of Paris), Love Story is a tale of love in the city of lights – a delicate floral that tells the age old story of Parisian romance. Chloe Love Story opens crisp and bright with a wealth of dazzling citrus. Neroli and bergamot bring a flash of sunshine and mandarine adds some tartness, whilst the fuzzy acidity of blackcurrant gives a soft biting undertone. There’s an immediately spring-like feel to it that feels alive, evoking the idea of bees fizzing around the heady tops of flowers as they sway slowly and softly in the spring time breeze. If you’re thinking that this sounds like quite a pretty picture, then you wouldn’t be wrong at all. Underneath all of that citrus bedazzlement is a floaty floral core consisting of orange blossom and stephanotis, these distinct floral tones provide indolic citrus warmth and indolic jasmine-like greenery, respectively. There’s also a touch of something sharper and more green, perhaps hyacinth, that gives that ‘florists fridge’ effect and cuts through the headiness of the more indolic white flowers. Musk also plays a big part, especially in the dry down. Musk gets a bad rep nowadays, especially the super-clean variety, which just so happens to be exactly the type that inhabits Love Story’s base. Here, the musk adds lift to the spring greenery that is the tale Love Story wishes to tell, allowing the base to become a natural wind filled with the scent of flower, leaves and stems cooling in the spring air. I’ve read mixed reviews of Love Story on the blogs. Many have called it ‘safe’ and even classifying it as a shampoo-esque floral, but I think it’s more than that. Sure, Love Story isn’t a revolutionary fragrance that defines a new genre, nor does it present the most unique interpretation of a spring floral, but it does have something working in its favour, and that is the fact that it is immensely pretty. Love Story is a sweet little floral tune that gets stuck in your head. It breezes around your brain and embeds itself in your emotional parts, causing you to fall slowly but surely in love. This entry was posted on Wednesday, February 11th, 2015 at 12:09 pm and is filed under Candy Perfume Boy, Fragrance, Guest bloggers. You can follow any responses to this entry through the RSS 2.0 feed. You can skip to the end and leave a response. Pinging is currently not allowed.